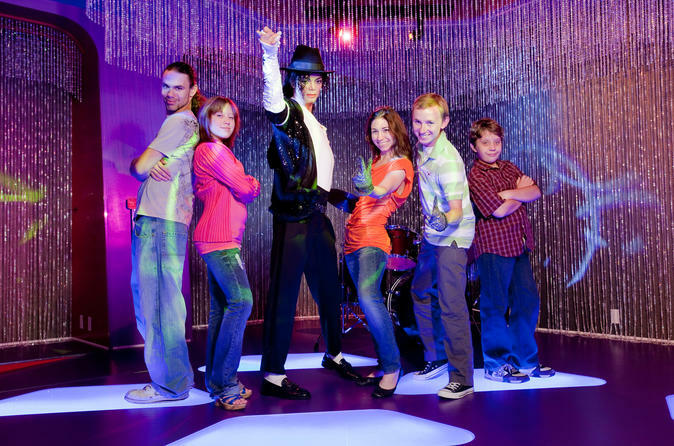 This Madame Tussaud’s Hollywood Behind-the-Scenes Package combines two of Hollywood’s most iconic and highest rated activities into one affordable option — Madame Tussauds Hollywood Museum and our world famous Hollywood Behind-the-Scenes tour of downtown areas. Explore Madame Tussaud’s extremely life-like wax sculptures and make some great photos. Snap picture with Michael Jackson, Lady Gaga and all your other favorite celebrities. Once you've snapped enough pictures, head out on a tour of Hollywood with an expert guide. Hollywood Behind-the-Scenes is a world renowned experience that connects visitors with the Hollywood they imagine. Visit movie locations that stared A-List Celebrities (Julia Roberts, Keanu Reeves, Sandra Bullock, MarkWahlberg, Charlize Theron, Cameron Diaz, Drew Barrymore and more), visit legendary movie palaces, find your favorite Celebrity’s star as we walk the Walk of Fame, view the Hollywood Sign, and visit celebrities’ favorite hidden hideaways. Go inside places normally closed to the public. Place your feet onto your favorite celebrity’s footprints at the Chinese theater. Walk the footsteps of the Movie Stars when you visit Awards Walk, home to the Academy Awards. This tour changes your Hollywood visit from ordinary to extra-ordinary!